Aswan is the smallest of the three major tourist cities on the Nile. Being the furthest south of the three, it has a large population of Nubian people, mostly resettled from their homeland in the area flooded by Lake Nasser. Aswan is the home of many granite quarries from which most of the Obelisks seen in Luxor were sourced. Aswan was the ancient Egyptians' gateway to Africa. Aswan International Airport is situated 25km SSW of the city, on the west bank and just south of the high dam and takes roughly 30-40 minutes of travel time. Public buses don't go to the airport and security on the approach road to the terminal is tight so keep your passport and proof of ticket handy. Taxis in Aswan are not metered, so you should agree to a price before the taxi starts moving. The normal daytime tourist fare should be around 100 EGP (~USD $5.50, November 2018) during the day, and 130-150 EGP at night. Several airlines operate services to Aswan International Airport including EgyptAir  (to/from Abu Simbel, Cairo, Luxor), LotusAir (to/from Cairo), and NileAir (to/from Cairo). Egypt's passenger train service runs along the Nile between Cairo and Aswan. Travel time from Luxor is around three hours on 1st/2nd class AC services.More than five trains AC service arrives from Cairo each day, journey time to Cairo is around 13-14 hours costing 75LE for second class, 113LE first class recommending booking in advance and avoid black market offers from the people around the station . In addition there are two sleeper trains, departing 8PM and 9:35PM from Cairo's main train station "Ramsis train station" you can easily reach it by Cairo Metro "Elshohadaa Merto station", prices start from US $120 Single/$100 Double (Mar 2014). Some travel agencies in Cairo might be able to get $90 for Double. Technically foreigners are not allowed to buy tickets for non-sleeper trains from Cairo to Luxor or Aswan. This flawed security measure can easily be ignored by using a self service ticket machince or simply buying a ticket on the train. The latter options includes an insignificant surcharge of a few LE but is perfectly legal, legitimate and common practice. You will not have a reserved seat if buying the ticket on the train however, so you may be moved around once or twice. The train station is on the northern end of the city center, a few hundred meters inland from the river. Leave plenty of time to buy tickets, as the service at the counters is very slow. Mini buses depart from outside the station (turn right as you exit the terminal), and there are a number of cafes and basic hotels on the blocks between the station and the river. It is now possible to drive from Aswan to Sudan. There is a border crossing west of Lake Nasser which is open of 01/17. The other crossing, from Wadi Halfa involves taking a daily ferry (other than Friday) from Qustul across Lake Nasser to Abu Simbel. "8 March 2016" There's bus move to Aswan from Cairo main bus station Al-torjoman 17:00 clock price is 130LE + 10LE "if they discover you are foreigner" the price and date must be printed on the ticket in english numbers to avoid mistakes. Tickets can be purchased at the Al-torjoman bus station from upper Egypt company window. "not recommended because the bus arrives to Aswan the next day 09:30 AM if the driver is fast it arrives at main bus station 3km north of Aswan train station take a taxi for 10LE or shared taxi for 1LE to the town. "8 March 2016" Several lines go to Aswan from Ahmed Helmy bus station behind Cairo railway station building. "not recommending at all even the Egyptians avoiding this old dirty costly buses"
There is one direct bus (AC Volvo) that goes to Aswan from Hurghada leaving at 22:00 every evening operated by a company called StarJet and takes approximately 9 hours with 3 to 4 fifteen minute breaks along the way. The coach leaves from Zahran bus station at Al-Nasr Street in Hurghada town centre and costs 70LE. Note that at least as of October 2016 only those with Egyptian nationality are permitted to travel on this StarJet coach. If a non-Egyptian is found on the coach StarJet is fined 50,000LE by the Egyptian authorities so they will not give tickets to anyone who cannot prove their Egyptian nationality until the restriction is lifted. For non-Egyptians, the only coach option is to travel from Hurghada to Luxor and then from Luxor to Aswan. "8 March 2016" There's another bus come from Suez at 22:30 and another 00:30 midnight come from Cairo and both maybe stop in Hurghada to drop off some people (upper Egypt company), the bus is often come crowded and people stand in the bus aisle and it's really impossible to occupy a set buses cost 70LE. Tickets are sold on the bus if you fight well and win a seat, but be sure to ask the price at the ticket office, because the ticket seller on the bus will often raise the price 10LE or so and pocket the excess if he discover that you are a foreigner or non Arabic speaker, take in consider that you maybe wait 2 hours or more before the bus arrive and maybe the bus come full and nobody will drop off inHurghada so to the driver use Hurghada ring road and avoid Hurghada station. Other indirect way to go to Aswan from Hurghada if you don't like night travel is to take the 8:30AM bus to Luxor for 50LE, which takes 3 hours. The company name is "Superjet" beside Zahran store at Al-nasr st. when you arrive Luxor run to the train station north from the bus station to catch the train because if you missed it you will wait few hours to the next train to Aswan for 30LE if you find the ticket in the booking window about 40 if you go to the train without booking that's mean maybe you don't have seat and 50LE from the black market sellers around he station and that not recommended maybe sold you a ticket for a train left the station and other ticks you don't need it just avoid that. It is now possible to take a bus between Aswan and Khartoum, Sudan. Some buses overnight in Wadi Halfa while others use the new border crossing west of Lake Nasser and therefore drive through the night taking up to 27 hours for the whole journey. Cost is around 500EGP. The River Nile as it passes through Aswan Dozens of cruise ships travel between Luxor and Aswan. Aswan-Luxor takes 3 nights while Luxor-Aswan takes 4 nights. As of Mar 2014, boats depart from Aswan 3 days per week. These can be booked through booking.com or agents or at the actual ships themselves. Also a boat to Wadi Halfa in Sudan departs once a week on Sundays (Feb 2014). Tickets go on sale on Monday for the following sunday and sell out quickly. Alternatively instead of waiting in Aswan for a week, a fixer can be used to arrange a Sudan visa in 15 minutes, a spot on the boat (Even on the actual day of sailing) and help getting through the terminal. Price would be between 50-100 EP for the service. Aswan is compact enough to negotiate primarily on foot. To access Philae, the High Dam, and the unfinished obelisks, you can take a taxi or a horse-drawn carriage. A taxi excursion to all of these sights should cost 80LE to 100LE per vehicle. To access the sights on the river islands or on the West Bank, you will need to cross the river by motor boat or felluca. Be sure to pay attention to the price as operators try to overcharge tourists. If you take the public ferry to the West Bank, you pay only 5LE. The souqs (markets) in Aswan are refreshingly exotic without the same level of high-pressure selling found in some tourist towns further north. You will generally find that Nubian handicrafts are of higher quality and better value in Aswan. All other goods will be more expensive than in Cairo due to shipping costs to Aswan and the lower tourist demand. Having said that, the Aswan souk still has a lot of unscrupulous sellers trying to con their way into selling you low quality goods at high price. Try your best to compare the prices before buying and don't be hesitant to haggle. As in Luxor some restaurants have two identical menues: one with Egyptian prices in Arab, another one with (double) tourist prices in English. Also keep in mind that many restaurants add charges that increase your bill with about 20% Check before you order. Aswan is Egypt's capital of sugarcane. When you are there you should try the fresh sugarcane juice, it costs about 1LE. There's a recommended sugarcane juice shop nearby the Catholic basilica near to "the souk", but remember to ask for a straw because they don't wash the glass well. You can enjoy many sugarcane juice shops as you walk around. 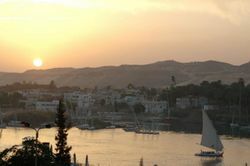 Sunset over the Nile in Aswan, view from The Philae Hotel. Note that some hotels might treat prices below quoted in "LE" as "US dollars" to foreigners, eg Philae Hotel quoting 60LE meant 60US Dollars in 2016. Keylany price at $23USD for ~windowless single ac room off Nile waterfront was correct as at 2016. Aswan is generally a very safe city.Watch out for pickpockets in the souq. These thieves will approach you carrying scarves, shirts or even papyrus in one hand to sell to you, while attempting to go into your pockets with the other hand. Most horse carriage drivers will not commit on the price when you arrive at your destination and you're expect to give more. Once you escape the tourist-heavy places (i.e. the corniche), you'll find that many of the locals are very friendly as is Egyptian culture. If you go into a shop to buy some snacks/water and the owner does not have change, it is not at all uncommon to see him look for change while leaving you alone in the shop. Egyptians are by nature very friendly and honest people, with an unfortunate population corrupted by the need to scam and steal from tourists. Internet access is available at Keylany Hotel for free and Noorhan Hotel for 10LE per hour but internet speeds are very slow. Kothor Hotel has reasonably faster internet available for 5LE per hour or 10LE unlimited during your stay. 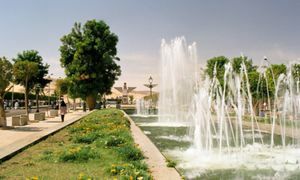 There is so much to do around the Aswan area that time can be an issue. The local people are generally very cooperative, and for a price, doors might remain opened regardless of the hour. 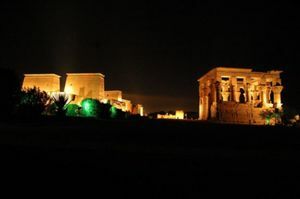 Taxi trips or organized tours to the nearby towns of Daraw and the Temple of Kom Ombo further north on the Nile. These trips should cost 150LE. Arrange this carefully as a police convoy may well be necessary. Cruises to Luxor - The 2-night cruise should cost US$75++ per night, including meals, depending on the boat. Sep. 2016: tourism is so low that 5-star luxury cruises are willing to pick up passengers for a very inexpensive price. No drinks are included on cruises, not even water. On board they charge 15LE for a bottle, so make sure to sneak in as much as you can while still in Aswan. Opening hours: 8h30-12h30, consulate is closed on Wednesday, Friday, and Saturday. In order to apply for a visa you must have 2 passport sized photos, one photcopy of you passport picture page and one copy of your Egyptian visa page. Visa costs 150US$ now since Nov 2018, seemingly for all nationalities. Be aware that when paying for your visa make sure you give them notes of 50USD and above as they do not lower notes. Application can take up to 7 days but asking can make you get it faster (2days). I got it within three days. When handing in your passport they give you a piece of paper with a date when the visa is ready. I applied 21 DEC 2017 and picked it up 24 DEC 2017. Numerous other travelers had the same experience. This page was last edited on 5 December 2018, at 20:09.